There seems to be a lot of confusion among contractors as to what exactly is expected when preparing Schedule J in the annual incurred cost submission required by FAR 52.216-7. According to Subsection (d)(2)(iii)(J) of that contract clause, Schedule J is to include a "... listing of subcontracts awarded to companies for which the contractor is the prime or upper tier contractor (include prime and subcontract numbers, subcontract value and award type, amount claimed during the fiscal year, and the subcontractor name, address, and point of contract information)". The confusion comes in trying to understand which subcontracts to include in the Schedule; is it all subcontracts awarded by the contractor? Is it just those subcontracts awarded under flexibly-priced contracts? Or, is it flexibly-priced subcontracts awarded under flexibly-priced contracts and upper-tier subcontracts? Depending upon what auditor you happen to run into, it could be any of these. DCAA's adequacy checklist for incurred cost proposals contains the following items relative to Schedule J. Ensure the schedule includes all types of subcontracts (e.g. cost-type, T&M, IDIQ, and FFP) and intra-company costs claimed by the contractor on flexibly priced prime and/or upper-tier subcontracts. Ensure the contractor has included all of the detail for the subcontracts (subcontract number, prime contract number, subcontractor's name and address, point of contract, subcontract value, period of performance, costs incurred in the FY, and award type). So, according to the DCAA checklist, Schedule J should be limited to subcontracts and intra-company transfers awarded under flexibly-priced subcontracts and upper-tier subcontracts. That eliminates any subcontracts awarded under fixed-price contracts, which makes sense. Note here that DCAA's checklist includes intra-company transfers, something that the FAR does not require. The necessity to include flexibly-priced subcontracts in Schedule is rather obvious. Those subcontracts need to be audited before the auditor of the prime contract can render an opinion on the propriety of contract costs. The auditor needs to determine whether the subs have been audited by either a Government contract audit agency or by the contractor's own internal audit staff. Someone has to audit the subs and attest to the allowability, allocability, and reasonableness of those costs. But why fixed-priced subcontracts awarded under flexibly-priced contracts and upper-tier subcontracts? Should they be included or excluded from Schedule J? Here's where things often get contentious. Obviously, fixed price means fixed price and the costs of a fixed price subcontract does not need to be audited. The costs still need to be supported but the support required for fixed priced subcontracts would be the same as for any other type of cost; labor, materials, ODCs, etc. Review the results of the DCMA purchasing system review for any risks identified in subcontracting. Arrange for a meeting to discuss subcontract management processes and the exten of the contractor's evaluation of subcontract costs to ensure compliance with FAR 15 and FAR 31. Determine if approvals were made at adequate levels, materials/services were needed for the contract, prices and units on the invoices match prices and units on the purchase orders, goods were received, prime contractor paid the subcontractor prior to claiming the cost on the prime contract, and costs were properly recorded. An auditor can perform the preceding steps without having the fixed priced subcontracts listed in Schedule J. To us, it seems like quite a stretch to insist otherwise. However, it is usually more efficient in the long run to simply provide whatever data a particular auditor deems is required under this provision. The FAR (Federal Acquisition Regulation) Cost Principles Guide has now been updated through FAC (Federal Acquisition Circular) 2005-76 (September 2014) and is available for download here. The previous update was January 2013 (through FAC 2005-65). The FAR Cost Principles Guide traces all the changes to FAR cost principles since the inception of the FAR system in 1984. It is useful for determining the precise cost principle in effect at the time a particular contract was awarded. While some cost principles have not changed in the ensuing years (e.g. bad debt expense, alcoholic beverages) most have undergone some form of revision and some have even been eliminated (ADP equipment). The Compensation cost principle (FAR 31.205-6), for example, has been revised 39 times. Six of those changes were effective in 2013 and 2014. By contrast, FAR 31.205-51, Cost of Alcoholic Beverages, has never changed since its first introduction in 1986. The Government's contract auditors are busy clearing up its backlog of old incurred cost submissions. These audits, going back to 2006 in some cases (and perhaps earlier), must evaluate costs based on the cost principles in effect during that year or, in some cases, when the contract was awarded. Any challenges to claimed costs must cite not only the correct cost principle, but the correct version of that cost principle. This guide will help ensure accuracy on everyone's part. Thanks to a reader who alerted us that the "Guide" had been recently updated. Contracts greater than $25 thousand for the provision, service, or sale of food in the United States include FAR Clause 52.226-3, Promoting Excess Food Donation to Nonprofit Organization. This provision encourages contractors, to the maximum extent practicable and safe, to donate excess apparently wholesome food to nonprofit organizations that provide assistance to food-insecure people in the United States. The prescription for this clause comes from another FAR provision, FAR 26.4, Food Donations to Nonprofit Organizations. That's a pretty nice gesture isn't it? After all, why throw away food that meets all quality and labeling standards but may not be readily marketable due to appearance, age, freshness, grade, size, surplus, or other conditions? Contractors would probably donate their surplus food anyway (grocery stores donate food to local food banks all the time) without Government intervention but now, the Government is encouraging them to do it. How? How is the Government encouraging contractors to donate surplus food? That is a good question. The only "encouragement" we can find in the relevant FAR passages is freedom from being sued. FAR exempts the Government and contractor personnel from civil and criminal liability to the extent provided under the Good Samaritan Food Donation Act (see 42 USC 1791). This means that if someone gets sick from eating donated food, they can't sue the Government or the contractor. We guess they could still sue the poor 501(c)(3) organization that distributed the food to the "food-insecure" people, but contractors, you're home free on this one. Perhaps indemnification is not enough incentive or "encouragement". Maybe the contractor needs to be reimbursed for the cost and logistics of collecting, warehousing, transporting, maintaining the safety of, and distributing the food. That could get expensive. Certainly there is some incremental costs associated with these activities - we're not talking about fixed costs here. Reimbursing contractors for such costs would certainly encourage them to donate their surplus food. Yes, it would, but it isn't going to happen. FAR is not going to allow it. FAR 31.205-1(f) lists eight specific public relations and advertising activities that are unallowable under Government contracts. The eighth item, added in 2009, disallows costs associated with the donation of excess food to nonprofit organizations in accordance with the Federal Food donation Act of 2008. That would, of course, include labor costs as well as transportation costs. So from a contractor's perspective, there's not much here to "encourage" contractors to donate surplus food. If funds are tight, contractors are going to dispose of excess food in the most cost-efficient method, FAR or no FAR. The Department of Energy (DOE) Office of Inspector General issued a report yesterday that was critical not only of one of the Department's contractors but of the Department itself for failing to adequately monitor the progress of a clean-up contract. The contract required demolition of a highly radioactive building. Initially, it was going to cost $581 million and completed by September 2013. Later, the cost estimate rose to $753 million with a completion date pushed out to September 2014. Well, September 2014 is pretty much gone and the building is still standing. The current estimate for completion is $932 million and a completion date of September 2016. Unavailable or deficient work packages. In 2012, there were at least 40 instances where work shifts were not worked due to either unavailable or deficient work packages. Project officials commented that (Union) workers were encouraged to stop work when uncertain on how to proceed, and that in some cases, worker preferences on how work packages should be written, stopped the work. Really? This makes us wonder about who is managing who. Who is really calling the shots here, management or the union? Insufficient labor resources to perform work. Also in 2012, the DOE reported 47 instances where work shifts involving 9 to 12 employees per team, were not worked. The report doesn't say why those shifts did not work. By our estimate, this works out to $250 thousand (with fringes). Employees not always productively employed. Report identified employees reading books, playing chess and visiting on cell-phones for several hours. Sounds like they're running a tight management ship. Productivity issues. A 2013 study noted that 80 percent of planned work was not performed when scheduled in 2012. There were delayed starts, rescheduled work, and other events that impacted the schedule. Management acknowledged that this was a major concern. The report laid most of the blame for the delays and cost growth at DOE's management. DOE did not fully enforce contract requirements. DOE did not adequately track, trend, and resolve issued. DOE did not require the contractor to develop corrective action plans. DOE did not perform necessary QA audits and assessments. The DOE-IG made some recommendations which DOE management concurred with. That really means that DOE management is going to get tougher on its contractors. To read the full IG report, click here. The desktop versions of QuickBooks (Pro, Premier, and Enterprise) are considered "mature" products and the changes from one year to the next are relatively minor. That is why a lot of companies do not need to purchase the annual upgrades that come out every Fall. Although the cost for companies running a single installation of Pro is relatively minor (you can usually find it for less than $200), the cost is more significant for multi-user installations and the Premier and Enterprise versions. For companies that have purchased add-ons, those products will most likely need to be updated as well, increasing the cost even more. Since Intuit supports its products for three years, there is often little to compel companies to buy the annual upgrade. The 2015 versions of QuickBooks have just been released and we've had a chance to kick the tires, so to speak. 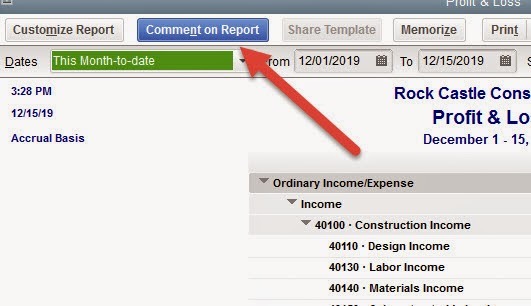 One added feature that we like and might prove useful for contractors is the ability to add comments to reports. This provides an easy method for providing information, comments, or questions about items in a report. For those of you who send lengthy emails with questions about report information, this allows you to comment right on the report. Here's how it works. When you run a report, there's a new blue button at the top called "Comment on Report"
Selecting this option, places check boxes to just to the right of the data. Clicking in the box adds a reference number and allows you to enter unlimited narrative that corresponds to that reference. Additional comments are simply incremented from 1 to 2 to 3 and so forth. Here's the comment, always at the end of the report - like a footnote. In some situations, this is a very valuable feature. Whether it is important enough to compel an upgrade is a business decision. We might suggest that if a company is still using a 2012 version, it might be time to upgrade anyway as Intuit is sun-setting its support for that version. Last December, a DCMA (Defense Contract Management Agency) contracting officer (CO) issued a final decision to Beechcraft Defense Company (BDC) alleging that BDC was noncompliant with CAS (Cost Accounting Standard) 402 from 2006 to present. The final decision asserted a government claim for $5.9 million, including interest. In February of this year, BDC appealed the final decision to the ASBCA (Armed Services Board of Contract Appeals). Subsequently, BDC filed a motion arguing that since the appeal involved a Government claim, the Government was in a better position to file the complaint and that the proceeding would be facilitated by the Government's filing of the initial pleading setting forth the full rationale for the assertion of its claim. The Government responded that while it recognized the appeal involved a Government claim, the appellant, BDC, was in the best position to assert the facts that would establish a compliant accounting practice. Directing the Government to file the complaint would facilitate these proceedings because it would establish the factual and legal allegations underlying the Government's position from the outset, rather than having Beechcraft draft a complaint that speculates about the grounds for the Government's claim, and which may include information that is not relevant to the dispute. When it comes to CAS Noncompliance, the Burden of Proving Noncompliance is upon the Government. The ASBCA agreed with BDC. The Board stated that the Government's response evidences a basic misunderstanding concerning the alleged CAS violations. "It appears the government believes that it is appellant's burden to establish that its accounting system is CAS compliant. The law is otherwise. The burden of proving noncompliance is upon the government". In the circumstances of this appeal, we conclude that the proceedings would be facilitated by the government setting forth in an initial pleading, the facts and rationale for its CO's decision finding that Beechcraft was noncompliant with CAS 402 and the position the government is taking before this Board. We do not deem this requirement to be onerous. The government should be fully conversant with its own claim. It happens a lot. Closely held companies will close out their books for the fiscal year and find they had a pretty good year financially and so the executives (also the owners) declare a bonus. We've talked about bonuses on these pages before. See for example this page. The basic criteria for allowability is that bonuses must be paid pursuant to an established plan or policy followed by a contractor so consistently as to imply, in effect, an agreement to make such payments. So, most contractors will have written policies and procedures and board minutes to support bonus plans - even if bonuses are discretionary from one year to another. But there's additional criteria for closely held businesses. FAR 31.205-6(a)(6) states that compensation costs for certain individuals give rise to the need for special consideration. Such individuals include owners of closely held corporations, members of limited liability companies, partners, sole proprietors or members of their immediate families. For these individuals, compensation must be reasonable for the personal services rendered and not be a distribution of profits (which is not an allowable contract cost). So, how does one go about determining whether a bonus is truly a bonus and not a distribution of profits? Therein lies the challenge. Government auditors, for certain, are going to take the position that any bonus paid to an owner of a small or closely held business represents a distribution of profits and therefore unallowable. That always puts the contractor on the defensive. Fortunately, there is some guidance on the matter from the ASBCA (Armed Services Board of Contract Appeals). How "substantial" the rest of the compensation was. In the Lulejian case, the Board ruled that because there were no dividends declared, the top four executives garnered 51% of the bonus pool, and their compensation was otherwise substantial, the bonus represented a distribution of profits and therefore unallowable. In a later case (see SplashNote Systems, ASBCA No. 57403), the Board found that no dividends were paid and the top executive garnered 71% of the pool. Although compensation was reasonable, the company failed the other two tests and therefore the bonus was a distribution of profits and unallowable. Closely held corporations should assess the propriety of bonus costs using the three criteria established by ASBCA. The total amount of IR&D costs applicable to the product can be identified. The pro-ration of such costs to sales of the product is reasonable. The contractor had no Government business during the time that the costs were incurred or did not allocate IR&D costs to Government contracts except to pro-rate the cost of developing a specific product to the sales of that product. No costs of current IR&D programs are allocated to Government work except to prorate the costs of developing a specific product to the sales of that product. If the Government decides to recognize deferred IR&D, the contract must include a specific provision setting forth the amount of deferred IR&D costs that are allocable to the contract. Additionally, the Government must document in its negotiation memorandum the circumstances pertaining to the case and the reason for accepting the deferred costs. Back in 2000 and 2001, a contractor capitalized some IR&D costs that it incurred to develop software that it asserted was a precursor to that required for an Air Force contract. It amortized the development costs in 2002 through 2005 of which some of those costs were allocated to the Air Force contract. The Air Force contract did not contain a provision allowing deferred IR&D costs be to charged. "In this case, there is nothing in the contract specifically authorizing any deferred IR&D costs to be charged to this contract as specified in FAR 31.205-18(d)(2)..."
That decision is pretty straight forward - no contract authorization, not allowable. If you've capitalized IR&D costs that you hope to amortize over future Government work, you need to ensure that it is specifically spelled out in your contract(s). There are probably some contractors thinking to themselves right now: "Its about time" - perhaps even some of those are ready to file Amicus Curiae briefs. Yesterday, Kellog Brown & Root Services Inc. (KBR) filed a suit against the U.S. Government acting through its agent, the Defense Contract Audit Agency (DCAA) in Federal Court (the U.S. District Court for the District of Delaware). The lawsuit seeks to recover $12.5 million in legal fees incurred by KBR in defending against what were ultimately determined to be "defective" DCAA audits. There are many facets to this lawsuit but the underlying complaint is that DCAA was negligent in performing its audit work and did not follow a number of Generally Accepted Government Auditing Standards (GAGAS). Which standards? Oh, some of the basic ones including qualifications, independence, planning, risk assessment, written audit program, briefing the contract, field work, supervision, and sufficient evidence to support conclusions. The contract, known as LOGCAP III required KBR to perform a wide variety of functions, including construction and operation of military dining facilities, laundry, welfare and recreation services, facilities maintenance, power generation and distribution, waste management, water supply, vector control, fire protection, billeting, and equipment maintenance. The contract included a clause that required the Army to provide "force protection" to KBR and its subcontractors commensurate with that provided to DoD civilians. By 2003, however, KBR was performing work in a hostile environment where insurgent attacks were frequent. In fact, KBR and its subcontractors lost 75 employees as a result of hostile actions and almost 500 more injured. As a result of the hostilities and the Government's failure to provide force protection, KRB hired some private security contractors and charged those costs to the Government. DCAA decided that since the contract provided for Army protection, the cost of the private security contractors was not allowable and disallowed an estimate of those costs. Ultimately, KBR appealed this action before the ASBCA (Armed Services Board of Contract Appeals) and won. The ASBCA ruled that the private security costs were indeed allowable under the contract. Simultaneously, the Government filed a false claims act violation against KBR for violations of the civil False Claims Act for billing costs associated with the use of armed private security. A short time later, the Government voluntarily dismissed the FCA case. In both cases, according to the current complaint, the Government's case was jeopardized by DCAA's defective auditing. Keep in mind that this complaint presents only one side of the story. Ultimately KBR is going to have to prove its case in court. But, its going to be interesting to watch and the outcome, if favorable to KBR, may embarrass DCAA. It is important to note however, that many of the criticisms levied at DCAA in this lawsuit have already been addressed and rectified by that Agency. The latest peer quality review conducted by one of its loudest critics, the DoD Office of Inspector General, was rated a "pass". If you would like to read the full complaint, you can download a copy here. The Office of Federal Procurement Policy (OFPP) and the Department of Defense issued a "Notice of Request For Public Comment" yesterday, seeking public input into the development of a report to Congress on alternative measures of determining allowable compensation costs. As we reported on these pages, the President, last December, signed into law the Bipartisan Budget Act of 2013 which capped compensation for all Government contractor employees at $487 thousand per year and became effective for contracts entered into after June 24, 2014. By law, this cap must be adjusted annually for inflation, based on the change in the Employment Cost Index for all workers (as published by the Bureau of Labor Statistics). A separate provision of that legislation (Section 702(e)) directed that OMB and DoD report to Congress on alternative benchmarks and industry standards for compensation, including whether any such benchmarks or allowable compensation. The $487 thousand cap was purely a subjective figure. Congress and the Executive Branch were proposing varying amounts based on the President's salary, the Vice President's salary and other arbitrary amounts. The old benchmark, which had grown to $950 thousand per year was based on the median (59th percentile) amount of compensation accrued over a recent 12-month period for the top five highest paid employees in management positions at each home office and each segment of publicly traded U.S. companies with annual sales over $50 million. Evidently, neither the OMB nor DoD came up with any good alternative benchmarks to present to Congress because they are now asking the public for ideas. Specifically, OMB and DoD are seeking public input on alternative benchmarks that would provide a more appropriate measure of allowable compensation including appropriate inflators (i.e., alternatives in lieu of the Employment Cost Index for all workers. Any public input should be accompanied by explanations as to why such might be more suitable than the benchmark and inflators set forth in statute. The new compensation cap is going to hit a lot of contractors, some pretty hard. Perhaps there will be some relief as a result of this request for public comment. It should be noted that the $487 thousand figure is an absolute cap on compensation. It does not mean however that contractors can pay any employee up to that amount and call it reasonable. The reasonableness criteria in the FAR cost principle for compensation still applies. Comments will be accepted until October 16th, 2014. In what could be construed a sad commentary on how contracting officers value the input of DCAA (Defense Contract Audit Agency) when negotiating contracts, the DoD-IG (Inspector General) released an audit report last week criticizing the Missile Defense Agency (MDA) for awarding a $1 billion contract without an audit. The IG undertook the audit as a result of a hotline call, probably from someone within DCAA who took umbrage with MDA's actions. It wasn't as if MDA had failed to request an audit - they dutifully requested DCAA to audit the contractors proposal. But they didn't wait for the audit before concluding negotiations. As a result of failing to wait for DCAA input, the IG estimated that MDA could have negotiated a significantly lower contract price and saved "millions of dollars in reduced contract fees". During the course of the audit, DCAA had requested additional time to issue its final report because it wanted to include the results of an assist audit of a major subcontractor. MDA granted a one month extension even though it knew the revised audit due date was beyond its deadline for negotiating the contract. MDA didn't bother to inform DCAA as to the negotiation deadline. Neither did MDA notify DCAA that the scope of the contract had been cut in half due to budget constraints. So DCAA was going merrily on its way auditing a proposal that was already obsolete and ultimately useless because it was timed to be issued after contract negotiation. It was pretty obvious that MDA didn't care about an audit nor did they value DCAA enough to even inform the Agency of the negotiation deadline or that the proposed scope of work had been cut in half. What did they intend to do with the audit results - paper their files? It would seem that MDA has not bought in to DCAA's vision statement: "Dedicated professionals working together to deliver top-quality audit services to support the Department and the warfighter, and to protect the taxpayer's interest." What were the recommendations and corrective actions as a result of the IG review? More training! (Training solves every ill, no?) The IG was happy with that corrective action. You can read the full IG report here. Last July 31st, the President signed an Executive Order (EO) entitled Fair Pay and Safe Workplaces. Briefly, this EO will require prospective contractors bidding on contracts greater than $500 thousand (a relatively low threshold) to self-disclose any violations of labor-related laws such as the Fair Labor Standards Act, OSHA, Davis-Bacon, Service Contracts Act, EEO, ADA, Age Discrimination, and more. The EO also prevents contractors from forcing employees to agree to arbitration in lieu of going to court. You can read a fuller synopsis by clicking here. Although the full impact of this new EO will not be known until the corresponding regulations have been issued, there has been a number of public comments and articles that are expressing grave concern with the entire concept. First of all, it affects many many companies. The White House estimates that it will affect 24,000 companies and 28 million workers. That's almost 20 percent of the U.S. workforce. That percentage would be much higher if public sector employees were removed. Some concerns were expressed in an article appearing in the Government Executive and authored by the Vice President of the Associated Builders and Contractors trade organization, Granted, this would not be considered an objective source but it does raise many valid concerns. Here are a few of the points the author made (parenthetical comments are ours). Many members fear that some of the best firms will be arbitrarily blacklisted from winning future federal contracts for committing even minor violations or a rapidly growing and constantly changing labyrinth of complex workplace laws and regulations. By seeking to impose new penalties on contractors beyond those specified by Congress, the president is exceeding his office's constitutional authority and undermining the carefully balanced contracting provisions that already exist. There is great concern that the livelihoods of federal contractors and their employees could be jeopardized or even destroyed based on the subjective decisions of a team of newly selected, unelected bureaucrats, who will be charged with picking winners and losers in federal contracting. Although this EO became effective on the date of signing (July 31, 2014), it will apply to solicitations for contracts as set forth in any final rule issued by the FAR Councils. Since the FAR Councils have not issued their final ruling, it is not yet in effect. That process will take some time. Is Interviewing Someone at a Restaurant Allowable Recruitment Costs? We previously discussed the FAR 31.205-34 cost principle concerning recruitment costs. Click here to read that posting. In brief, the cost principle allows six categories of recruitment costs; help-wanted advertising, employment office, operating an aptitude and educational testing program, travel costs of employees engaged in recruiting, travel costs of applicants for interviews, and cost for employment agencies (not in excess of standard commercial rates). Back in 2011, the ASBCA (Armed Services Board of Contract Appeals) considered whether the cost of meals to discuss recruiting with professional colleagues is allowable. A Government contractor had claimed such costs, the contract auditor questioned them as not meeting the criteria of the FAR cost principle, and the contracting officer upheld the auditors position. The contractor then appealed to the ASBCA. The contractor's argument focused on two of the six enumerated allowable costs; travel costs of employees engaged in recruiting personnel, and travel costs of applicants for interviews. The Board noted that these two categories, by their terms, are linked to the travel cost principle, which allows costs incurred for lodging, meals, and incidental expenses only to the extent that they do not exceed the maximum per diem rates set forth in Government regulations and those regulations only authorize per diem payments for travel of more than 12 hours. These luncheons and dinners did not meet the 12-hour travel criteria so the Board denied the appeal. So, if your planning on conducting interviews of prospective employees over a lunch or dinner, do not expect that the cost of those meals will be allowable under Government contracts. Regular readers of this blog will recall our coverage of the alleged timecard fraud that occurred at DOE's nuclear cleanup site in Washington State. You can read here and here and here for a refresher. The local newspaper for that area reported this week that the first five defendants are scheduled to go to trial beginning September 29th. We've been watching this story with keen interest because its the first time, to our knowledge, that employees are being held personally accountable, in court, for participating in timecard fraud. Usually contractors that get caught get a slap on the wrist and maybe the employee is terminated or suspended for a period. The contractors promises to improve its internal controls and after a short period, life returns to normal. In this case, the contractor has already repaid $18.5 million and several employees have plead guilty and were fined. Other participants are going to trial. The crux of this case involved the payment of overtime for hours not worked. Employees (with the support of their union) refused to work overtime unless they were guaranteed eight hours. In many cases, the work requiring overtime did not take eight hours so the employees were allowed to go home after their tasks were completed, yet they were paid eight hours of overtime. The first five going to trial were supervisors who did not review and approve timecards but were responsible for getting work completed. These supervisors would go out and solicit volunteers for overtime even though they knew that workers would only volunteer if overtime was offered in eight hour shifts. They knew that the work to be performed would not take eight hours and they told the workers that they could go home after the work was completed and they knew that those employees would be paid for eight hours of work. In addition, they claimed eight hours of overtime for themselves. One of these defendants was paid $64 thousand in overtime in one year. Others earned between $12 and $20 thousand in overtime. The prosecution's case will be supported by the testimony of nine subordinate employees who have already plead guilty to timecard fraud and punished, plus testimony from other employees as well as timekeeping records. Timekeeping went wrong on so many levels. There was the contractor with a big cost-type contract with little or no incentive to control costs. There were the employees with their powerful union that pushed its weight around - threatening production. There were employees, supervisors, and managers who benefited monetarily from the scheme. There was a lack of Government oversight that allowed the scheme to fester for such a long period. For contractors and contractor employees alike, this should be a significant wake-up call that the Government will pursue timecard fraud as far as necessary. Yesterday we asked the question "Is the data from your computer any good?" This is more than a rhetorical question - all auditors, including contract auditors and the independent public accountants that perform attest functions (e.g. those who audit your financial statements) must necessarily concern themselves with the validity of data produced by electronic means. There is always the specter of underlying fraud and auditors are required by Generally Accepted Auditing Standards (GAAS) or Generally Accepted Government Auditing Standards (GAGAS) to consider fraud when assessing risk and designing transaction plans. However, far more likely are simple errors. Sometimes these errors can be very significant. We just finished an audit where some revenue items were mapped to an expense account so that instead of increasing revenue, the transactions decreased expenses. That was caused by a fundamental misunderstanding of how the accounting software worked. It resulted a "material" error (in auditor jargon, that means significant). But it was not fraud. Periodic internal and external reviews of IT operations to ensure that policies and procedures have been implemented and are working effectively. Duties and responsibilities should be adequately segregated so that no one person can perpertrate and conceal material errors or misstatements. System and application software should be consistent with management objectives, operate within specifications, tested prior to implementation, and not susceptible to unautorized modification. Access to computing resources should be limited to those individuals with a documented and authorized need for such access. Contingency plans should be developed to ensure data safety. At the other end of the spectrum are the very small contractors - sometimes one or two persons. These contractors, of course, do not have resources to dedicate to any internal controls, much less those affecting computerized information technology. In those cases, the auditor, if he/she does not have the time or resources necessary to test for the accuracy of computerized data will most likely qualify the audit report. That's not the most desirable thing for a contractor but in most cases, has not practical implications. For example, when evaluating a price proposal, the auditor might state word to the effect that the audit results reflect data based on computerized information systems that have not been audited. That probably would not prevent a contracting officer from negotiating and awarding the contract but it does protect the auditor if subsequent events disclose that such data was unreliable. At the end of the day however, no one likes qualifications so auditors will usually undertake some level of analysis to gain assurance that IT systems (Information Technology) are operating as designed. The auditor might track a few transactions from source document to general ledger, a timecard to payroll, a material receipt to billing document. Contractors might wonder why auditors perform audit steps that have no apparent relevance to the audit they are performing. Its not unheard of that auditors will stray far from their appointed tasks. However, it is more likely that they are trying to validate the reliability of one or more information systems. If its not clear to you, it is certainly appropriate to inquire of the auditor the purpose of what he/she is doing. Is the Data From Your Computer Any Good? It wouldn't be an overstatement, would it, to say that just about every kind of information and data is electronic (or based on electronic systems) these days - accounting data, budgets and forecasts, purchasing, estimating, direct and indirect rate development, tracking, EVMS, and on-and-on. We've all come to rely upon Word, and Excel, and proprietary accounting software. Even auditors these days utilize electronic working paper applications to compile, prepare, and report on their work. So take the case of a typical proposal submission. It was probably submitted electronically, as per the instructions of most Request for Proposal (RFPs) or Request for Quotation (RFQs). The prospective contractor may have developed its estimates of material costs from historical purchases recorded in its electronic purchasing system. Its computation of direct labor rates would no doubt come from its timekeeping and payroll systems. Its indirect expense rate forecasts would come from data produced by the accounting software(e.g. QuickBooks) and perhaps some budgeting applications. Quantities (materials and labor), if there was useful production data for learning curve applications or other trends, would come from production schedules, also electronic. So now comes the Government (cost/price analysts, contracting officers, contract auditors, etc) to review, assess, and render opinions on the acceptability of proposed costs. The Government reps might break the submission apart and ask the prospective contractor to support various items of its proposal. Invariably, the supporting data will ultimately drill down to data from one or more electronic (computerized) system. How is the analyst or auditor to know, with reasonable assurance, that the underlying data is any good? What controls do contractors have to ensure the reliability and accuracy of their data systems? What is to prevent prospective contractors (like so many in unnamed foreign countries) to maintain two or three sets of books? Do contractors have trained and qualified individuals responsible for maintaining accurate data and records or has the task been seconded to someone who's skill set is in other areas (as is common in very small companies). Tomorrow we will look at how contract auditors respond to the problem of ensuring that they can justifiably rely on the accuracy of contractor prepared and submitted electronic data. Introducing a variety of contract types, business skills, incentive structures and different ways of doing business to be mutually beneficial to government and industry. A big difference in 3.0 from the other iterations is a focus on cooperation between the Government and contractors. That would be a good thing. One initiative that BBP 1.0, 2.0, and 3.0 have in common is "affordability" and "controlling costs". That's really the bottom line when it comes to procurement. One area that doesn't get a lot of attention in Government contracting discussions is the issue of effective inventory control. Inventory control is a significant management challenge at all companies, not just Government contractors, but at Government contractors in particular, the Government often ends up paying for inefficient inventory control - especially at contractors with significant cost-reimbursable effort. That is why sometimes, contract auditors will poke around and review contractors' inventory management policies, procedures, and practices. Ineffective inventory management results in too much inventory on-hand and where the carrying cost of inventory is significant, can represent a drain on company profits. Where the excess inventory becomes Government property (as in the case where purchases are made under cost reimbursable contracts), cost to the Government are increased. There are a number of policies and procedures that a contractor can effect to help ensure effective inventory management. Most of these apply to non-Government contractors as well. Test for indications of overbuying. Overbuying ties up funds in excess inventories. Excess inventories require investment of funds and do not contribute directly to current programs, projects, or deliverables. When establishing inventory requirements, consider whether frequent change orders have the potential of obsoleting items. Obsolete items are often worthless. Establish a program for standardization of component parts as a means of reducing the need for separate buying for individual contracts/projects/deliverables. Examine the causes for items that become excess and obsolete. Examine the causes for items in short supply and adjust inventory purchases accordingly. Determine whether there are effective procedures for evaluating repairability of production rejects. Determine whether there are effective procedures for disposing scrap. Are classification procedures adequate to determine what is usable, salvageable, or scrap? Are competitive bids secured for the sale of scrap? Contractors do not want to lose money by tying up funds in excess inventory or by purchasing too much inventory that may become obsolete. The Government does not want to pay for it either. Federal Acquisition Regulation (FAR) 15.306 in general, covers exchanges between the Government and companies that submit proposals after the Government receives those proposals. The emphasis here is on fair and consistent treatment among all offerors. FAR 15.306(d)(3) requires agencies to address during discussions, “[a]t a minimum . . . deficiencies, significant weaknesses, and adverse past performance information to which the offeror has not yet had an opportunity to respond. Although discussions may not be conducted in a manner that favors one offeror over another, and offerors must be given an equal opportunity to revise their proposals, discussions need not be identical among offerors; rather, discussions need only be tailored to each offeror’s proposal. Concerning a discussion on proposed prices, unless an offeror’s proposed price is so high as to be unreasonable or unacceptable, an agency is not required to inform an offeror during discussions that its proposed price is high in comparison to a competitor’s proposed price, even where price is the determinative factor for award. Nonetheless, it is inherently within an agency’s discretion to inform an offeror during discussions that its price appears to be high in comparison to other offeror's proposed prices, should an agency choose to do so. This is true without regard to whether the offeror’s price is higher or lower than the agency’s independent government estimate (IGE). In a recently published Comptroller General case, a (losing) bidder complained that the agency conducted unequal discussions when it learned during the debriefing stage that it had informed it that its price was too high in relation to the other bidder but did not inform the other bidder of the same. The Comptroller General (CG) did not agree. The CG noted, as discussed above, that it was within the agency's discretion during discussion to inform an offeror that its price is high in comparison to other offeror's proposed prices. As a matter of fact, both bids were higher than the IGE. The CG found no unequal or unfair treatment in the agency's decision to inform the protestor that its bid was too high. You can read the entire case by clicking here. The other day, we alluded to the recent peer review report issued by the DoD-IG (Inspector General) on the quality, adequacy, and sufficiency of the contract audits performed by DCAA's (Defense Contract Audit Agency). DCAA passed - sort of. The actual rating was "Pass with Deficiency". But, it was a "pass" nevertheless and DCAA, though not entirely pleased, can at least hold out that they have now passed a peer review. A triennial peer review is required for any Government agency or private firm that conducts audits in accordance with Generally Accepted Government Auditing Standards (GAGAS). Entities are required to develop policies and procedures that will provide it with reasonable assurance of conforming with GAGAS. Except for a lack of documentation in 11 of 92 audits reviewed, the IG peer review concluded that DCAA's system of quality control has been in compliance and suitably designed to provide the Agency with reasonable assurance of performing and reporting in conformity with applicable professional standards in all material respects. What does this mean for the contractor's that DCAA audits? As a practical matter, not much. Their audit reports will no longer contain a qualification that the Agency does not have a current peer review but that fact never seemed to bother the contracting officers to whom reports were addressed nor contractors who were the subject of audit reports. You can read the entire Peer Review report by clicking here. Over the years, we've covered all of the CAS (Cost Accounting Standards) Standards to some extent. Usually, the postings have been high-level summaries of the fundamental requirements of the particular standard. We have produced an index of those summaries here. These CAS summaries continue to be some of our most popular postings. Sometimes, we receive comments - questions really - on how to apply these requirements to specific fact situations Today begins a periodic series on applying CAS standards to real-life situations. These postings should be read in concert with the overview series and we will be adding these to our CAS index as we go. Today we begin with CAS 404, Capitalization of Tangible Assets. The overview of the standard can be found here. Essentially, this standard allows contractors to establish minimum capitalization policies for purchased assets. These minimums cannot exceed a useful life of two years or a value of $5 thousand, although they may be lower. The Standard also requires contractors to establish minimum dollar amounts for the capitalization of original complements of low cost equipment and for betterments and improvements. While it doesn't establish specific minimum thresholds, the aggregate represents a material investment. Here are some examples of how this Standard should be implemented. A contractor that has a policy of capitalizing tangible assets which have a service life of more than one year and a cost of more than $6 thousand, would be in noncompliance. The contractor would have to modify its policy to conform to the $5 thousand minimum established by CAS 404. A contractor that has a policy of capitalizing assets with a service life of more than one year and a cost of $250 would have to capitalize an asset with an 18 month service life and a cost of $300. Note, the Standard requires that capitalization be based on the contractor's written policy and capitalization policies may be less than the 2 year/$5,000 thresholds above which purchased assets must be capitalized. A contractor has an established policy of capitalizing tangible assets which have a service life of two years and a cost of $500. The contractor acquires an asset with a useful life of 18 months and a cost of $5 thousand. This asset does not need to be capitalized because the service life is less than that required by CAS and required by its capitalization policy. The other day, we reported on the revised FAR cost principle that implemented a Presidential Executive Order (EO) that disallows any costs associated with preventing or discouraging employees from organizing and joining unions. See: Rights to Organize and Bargain Collectively. Did you ever wonder just how many workers are represented by unions? We did. Based on data published earlier this year by the Department of Labor, Bureau of Labor Statistics (BLS), the union membership rate in 2013 was 11.2 percent. However, for private sector, the percentage was only 6.7 percent. Public-sector workers had a union membership rate that was five times higher than that of the private sector at 35.3 percent. This means that more than half of unionized workers in the US get their paychecks from the government.